The budget phones are getting better, and features reserved for the high-end mobiles are slowly making way to the affordable segment. The Infocus Vision 3 is the latest low-cost mobile from the American mobile manufacturer, Infocus, and comes with some nifty features. I have been toying with my review unit for a couple of days, and happy to report that certain things impressed me. Also, I am not sure about the price at the time of writing this review; I assume it will be close to Rs. 10,000 going by the specs and experience with the brand. Update – The company has shared that the phone is available for just Rs. 6,999. The Infocus Vision 3 (model number IF 9031) comes in a rectangular cardboard box with pictures of snow-capped mountains and an image of a bezel-free phone. The name Vision 3 and the low bezel phone on the cover, as shown in the image below, made it clear to me that it is a bezel-less phone even before unboxing it. Once I opened the box, I was greeted by the bezel-less Infocus Vision 3, that comes with a charger and a connecting cable. In the box, you will not find any protective case or earphones. Most phone manufacturers are leaving that choice to buyers these days, and offer a vanilla phone with a charger. I think it is a good thing not to have unwanted accessories, as companies always include the cost of these in the handset. The Infocus Vision 3 has a full vision display and a 5.7 Inch screen. The screen comes with an HD+ resolution (1440*720) pixels, even has the 2.5D curved glass. The bezels on all sides are minimal, and the cute looking mobile has an incredible 82.4% screen-to-body ratio. The front side of the phone looks like an endless display, as there is no home button or wasted space at the top or bottom. At the top side, there is a small camera lens and a speaker, concealed in a way to make the display look full vision (without any interruptions). One side has a micro-sd / sim card tray along with the power button; the other edge houses the volume rocker. The power button and the volume rocker are metallic with a ribbed finish to improve the grip, and they are quite sturdy. At the back, there are Dual cameras, near the top left corner, housed in a horizontal assembly, encircled by a chrome ring. The circular led flash is present besides the dual cameras, through which a faint antenna line passes. There is an antenna line on the bottom side too, and there is a single speaker grill, Infocus logo, slightly above this faint line. The circular fingerprint scanner with a slight groove rests in the middle of the back cover, and it works as intended. You can use a headphone with the 3.5 mm headphone jack available on the top side, further, on the bottom edge, there are a microphone and a micro-USB port. I have the midnight black color variant of the Infocus Vision 3; I believe the phone will come in more colors like white or gold. The back cover attracts finger marks, has a metallic finish, but seems made from polycarbonate material. The phone is portable and easy to use with one hand; it even houses a large capacity battery and still manages to look sleek. The Infocus Vision 3 runs on the Android Nougat 7.0 along with the Infocus Smile UX skin. 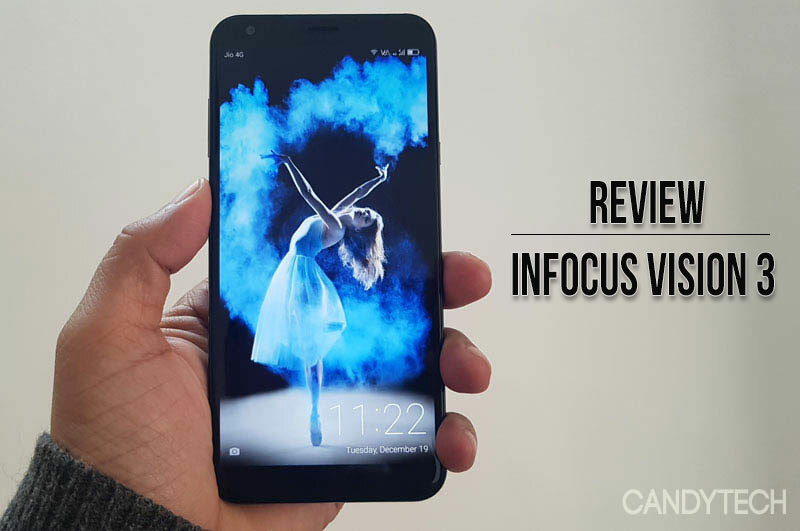 It is not the latest OS, Android 7.1 would have been preferable, but we are not missing much, as the Infocus Smile UX adds a plethora of exciting features to the stock Android. Further, the phone comes with the November Android security patch, essential for safety. Right from the start, there are some delightful features: whenever you press the power button, the Vision 3 greets you with a new beautiful lock-screen image. Further, there are plenty of custom themes available in the theme store that lets you convert the simple UI into a zoo of cute little Pandas (I downloaded the panda theme, it is pretty ridiculous but fun to use). You can spend some time with these to customize the interface and icons as per your need. Further, dive into the settings, and you will get all the nerdy options without even rooting the phone. You can use the quick access menu, by swiping from the top side on the home screen, like most Android phones, additionally, you can also swipe from bottom to access a secondary menu, like on iOS or Coolpad UI. There is an S-Boost App that helps to speed up your mobile by freeing up ram, defragmenting storage, and managing background processes. The Smile UX does not come with an app drawer unlike the stock android, all the app icons are accessbile from the homescreen. Notably, there are secret special settings that allow users to run twin apps, record screen and even create a second space. Furthermore, you can customize the home screen keys, enable navigation bar. Moreover, you can use a suspension ball (similar to iOS) to access app shortcuts like camera, screenshot, etc. There are a lot of options and tweaks that make the Smile UX highly customizable and user-friendly. To sum up, the user interface is thoughtfully designed with no odd looking icons or navigation elements. Lastly, the fingerprint scanner at the back works like a charm and can quickly unlock the phone; you can head over to Fingerprint settings to add upto five fingerprints. Processor and GPU – The Infocus Vision 3 draws power from the Quad-Core MediaTek 6737H processor with a maximum clock speed of 1.3 GHz. The processor is accompanied by the ARM Mali-T720 GPU to take care of gaming needs. The MediaTek 6737H is an entry-level chipset used in many phones like Micromax Bharat 4, Bharat 5, Panasonic Eluga Prim, Panasonic P9, Kult Beyond and Motorola Moto E4 Plus. Internal Storage and Ram – The mobile comes with 2 GB Ram, and there is 16 GB of onboard storage that can be further expanded to 64 GB, using the micro-sd card. The MediaTek processor is not as snappy as some of the Snapdragon counterparts, the Snapdragon 425 or the Snapdragon 430. The phone struggles if you open too many apps or too many tabs in Chrome. The lag and stuttering are visible even when switching between Apps or browsing a media-rich website. However, if you are watching a youtube video, making calls, chatting on WhatsApp, you will not find the phone lag in basic tasks. On the Antutu benchmark the Infocus Vision 3 scores 33,723; that is a low score, however, was expected from the underpowered MediaTek 6737H processor. The Geekbench score is 587 for the single-core, and 1643 for the multi-core test. The gaming performance is smooth for simple games like Need for Racing: New Speed Car or the Minion Rush: Despicable Me. I will also do more testing on games like Asphalt 8: Airborne and share if the phone lags or heats up. The Infocus Vision 3 comes with the Dual Rear Camera setup with a 13MP + 5MP sensor. The rear camera has 120-degree wide angle lens and also comes with a led flash. The camera App has some unique features like the “Dualfie” (you can simultaneously click a selfie and rear camera image). In the camera App, you can select the PIP mode, and half of the screen will show the rear camera image and the other half will display the front camera image. A bonus feature, you can even click multiple photos to make a collage using the multi-photo mode. There are some more exciting options worth a try, like the circle-mode, to click a circular image or to dive into the PRO mode for tweaking ISO, white balance or the exposure. Unfortunately, there are no settings to play with the shutter speed or manually adjust the white balance. Furthermore, the app has the option to use the brand logo on images, apply color effects, etc. Features aside, let’s look at some of the images I have clicked so far. The landscape images are average and lack detail, the colors are accurate, and the use of HDR helps to make the photos better. The camera works swiftly to adjust the brightness and even focus quickly in the daylight condition. I tried clicking this close range image, and surprisingly camera was able to capture a good amount of details and accurate color profile. The below image is clicked indoors with a lot of bright light coming from the window. In my experience, a lot of cameras fail to have balanced exposure in this scenario and tend to overexpose the window area, but the Vision 3 camera was able to adapt. The above image is clicked without flash, while the below photo is shot using the flash. The portrait shots with the background blur is the primary reason to buy a dual camera phone, as these can create a better background blur compared to the standard single camera phone. Here I am, enjoying the winter, in cold north India. The Dual camera works as desired, but you will need some practice to capture better portrait shots. (Keep the distance less than 1 meter and click it in broad daylight, for better results). There is some amount of edge blurring in portrait shots, similar to the blurring seen on other dual camera phones. You have the option to adjust the amount of blur in an image before clicking it. I liked the portrait mode images compared to the landscape shots on Infocus Vision 3. The Infocus Vision 3 comes with an 8 Megapixel front selfie camera with beautification slider, to soften the skin tone and effects. As expected the images from the camera are not highly detailed. Additionally, the background can suffer from overexposure, like in the image below. But you can click better selfies outdoor with this camera. The battery life on the Infocus Vision 3 is incredible, as the phone comes with a 4000 mAH capacity battery. Since the display and the processor are not power hogs, you can efficiently use the phone all day without the need for charging. The manufacturer says you can even reverse charge another phone or power bank with this mobile; I have not tested this feature so far. Also, the phone comes with a regular charger, lacks fast charging support. I am using the Reliance JIO sim-card with the mobile, and so far have not experienced any issues with call quality or data connectivity. Also, I tested the audio output with my Sennheiser PX 80 headphones, the sound quality is similar to most phones. The loudspeaker is present at the back instead of the bottom; this reduces the volume when you place the phone on a flat surface while using the speaker. The Infocus Vision 3 is the cheapest mobile to come with Dual camera setup and an 18:9 HD+ display. While I was working on this review, I thought Infocus would keep the price close to Rs. 10,000, but it is more affordable, priced at Rs. 6,999. The display is the biggest selling point for the Infocus Vision 3; the design is also praiseworthy. Infocus has managed to keep it thin despite having a massive battery. Moreover, the extended battery life is an added advantage for people who travel or use the phone for long hours. Also, the Dual Camera and Selfie shooter is above average and more exciting than most single camera mobiles in sub 10k price range. However, the low point is performance, as the underpowered Mediatek 6737H processor fails to deliver a lag-free experience. Further, it is passable for day to day usage but not an ideal processor. Besides, I am used to a Snapdragon 820 on the Samsung S7, and any lag is more apparent to me compared to budget phone users. The Infocus Smile UX has lots of options and tweaks that make the OS more enjoyable. You will like fiddling with features, and some of them may be useful in getting the most out of the Vision 3. To sum it up, the Vision 3 has its own merits and demerits, yet it is an exciting phone for a very affordable price. Also, You can read our review of the Infocus Turbo 5 Plus or the Xiaomi Mi A1 here. Infocus Vision 3 comes with a Bezel-less display and has a stunning design. The phone also offers great battery life and has above average camera quality. The performance is average and could have been better. Good Value for Money Mobile. Previous articleWhy is it a Bad Idea to Buy LeEco Phone or TV in India?